On February 8 we celebrate National Boy Scout Day to honor those who are trustworthy, loyal, helpful, friendly, courteous, kind, obedient, cheerful, thrifty, brave, clean and reverent. Founded in 1910, by American W.D. Boyce, the Boy Scouts of America has helped shape many of our nation’s leaders. According to legend, Boyce was lost on a foggy street in London when an unknown Scout helped him by guiding him back to his hotel. 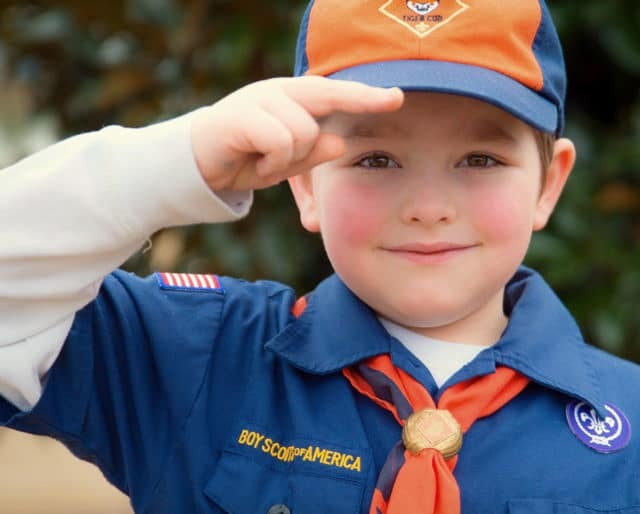 When the boy refused a tip, explaining that he was only doing his duty as a Scout, Boyce was inspired to bring the teachings of the British Boy Scout Association back to the U.S. The Boy Scouts are based on the idea of doing good deeds. Celebrate National Boy Scouts Day by helping someone in need, donating to a good cause or simply committing a random act of kindness. Earn your own Merit Badge by learning a new skill in one of the Merit badge categories. Take a look at the Merit Badge page on the Boy Scouts of America site and choose an interesting badge. (Coin collecting, anyone?!) Then follow the requirements listed. You may not receive an actual badge, but you will have learned something new and probably had fun doing it. Camping is an important part of being a Boy Scout and a great way to celebrate National Boy Scouts Day. Camping helps develop self-reliance and resourcefulness and promotes feelings of wellness from being surrounded by nature. So, gather the family or a few friends, load up the car or truck with your tents and sleeping bags and head to the nearest camping site. The purpose of the Merit badge program is to allow Scouts some time for career exploration. Boy Scouts earn badges by showing they have done or learned something in a specific area of study. There are over 135 different badges that can be earned in the areas of sports, crafts, science, trades, business and future careers. Some of our greatest national icons have been part of the Boy Scouts of America. Martin Luther King and John F. Kennedy were Boy Scouts. Steven Spielberg and Neil Armstrong were both Eagle Scouts. Michael Jordan was a Cub Scout and Jimmy Buffett was Life Scout. In total, 5 United States presidents and 180 U.S. astronauts have been involved in Scouting programs. According to the Boy Scouts of America, participating in a Scouting program can have a lasting effect on boys as they grow into men. 83% have stated that the values they learned as Scouts still impact their lives today. Of those involved for at least 5 years with the Boy Scouts, 87% feel their self-confidence can be linked to scouting. And half of those surveyed claim Boy Scouts helped them on their current career path.